SYRACUSE — It was one of the most ambitious projects ever undertaken by the Wawasee Community School Corporation. Putting a mobile electronic device in the hands of every student and teacher in the entire school district, not just a few grade levels as in the past. 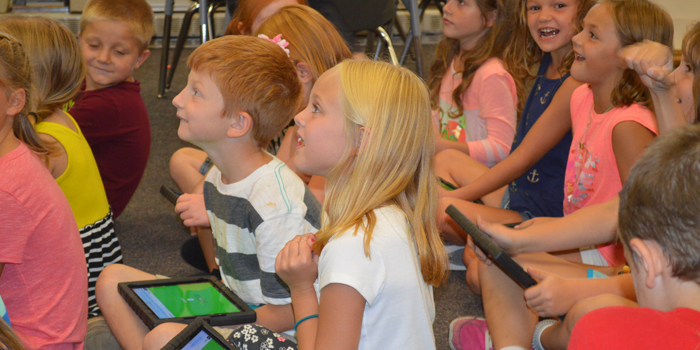 SYRACUSE — Second-graders in Julie Hays’ class at Syracuse Elementary School gathered on the floor with iPads in hand. They were about to try to solve math problems on the Kahoot website, a game based learning platform. SYRACUSE — Roll out for the 1:1 initiative computer devices for Wawasee Community School Corp. students will begin Monday, Aug. 8. Due to construction at Wawasee High School, dates and times were changed. SYRACUSE — Roll out for the 1:1 initiative computer devices for Wawasee Community School Corp. students will begin Thursday, Aug. 4.